Our regular blog readers may remember that back in June we posted about Dr. Morris Abramovitz. You can revisit that post here. We thought it would be fitting to present the finding aid of the archives portion of the collection as well. One of the amazing things about this donation is the scope — essentially the entire doctor’s office. So often archives and photographs and collections come in bits and pieces – one image of a doctor’s office, one medical book, one pair of eyeglasses. We can learn from these individual items, but we can learn more when we have them in combination. 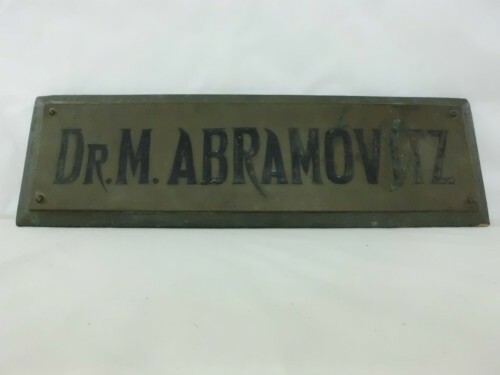 The Abramovitz Medical Papers were donated to the Jewish Museum of Maryland by Amy Abramovitz Kahn, Trustee for the Leonard J. Abramovitz Trust in 2001 as accession 2001.26. This gift was made in memory of Leonard J. Abramovitz, MD and Jeanne D. Abramovitz by their children, Amy Abramovitz Kahn, Lois Abramovitz, Debby Abramovitz, Janet Abromovitz and David Abramovitz. The collection was processed in September 2002 by Neil Barclay. Dr. Morris Abramovitz was born on November 14, 1879, near Kosvo, Lithuania. 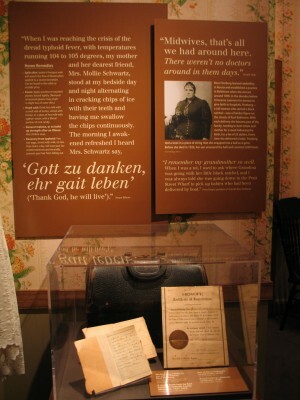 An Orthodox Jew, Morris came to the United States in 1901 on a Hamburg Steam Liner. Morris graduated from the University of Maryland Medical School in 1906 then practiced medicine on East Baltimore Street for forty-five years. During his career he invented a medical apparatus that withdrew blood from patients. Dr. Abramovitz spoke seventeen different languages, and was a gifted violinist. In 1911, Morris’s wife Pauline Wallerstein Abramovitz gave birth to their oldest son, Leonard. Leonard Abramovitz followed in his father’s footsteps by graduating from the University of Maryland Medical School in 1934. From 1934 until the start of World War II, Leonard practiced medicine with his father. Leonard served as a major in the U.S. army. Morris Abromovitz died in 1951. The Abramovitz Medical Papers contain mostly medical documents used at Leonard’s and Morris’s medical offices. Some of these documents include fragile office reference books. Additionally, the collection contains notes from the medical schools of John Hopkins University and the University of Maryland. The most unique document in the entire collection is the Hamburg Steam Liner ticket. This is the actual ticket that Morris Abramovitz used when he traveled to America from Lithuania in 1901 at the age of 22. The following collection is one of my favorites (mostly because of my interest in the history of medicine), but it's also a very useful tool for genealogists (as long as the genealogists' ancestors were born in East Baltimore around 1900). Rosa Fineberg acted as a midwife during the early twentieth century. She delievered hundreds of babies, and her record books include the names of the parents (only sometimes the name of the baby she delivered), dates, addresses, occupations, and national origins. Thanks to one of our very dedicated volunteers we are in the processes of creating a spreadsheet with all of the information from the books. When that document is complete (we have several months yet to go as it takes a VERY long time to type up hundreds upon hundreds of names, dates, addresses, etc.) researchers will be able to use it to find information faster, rather than having to leaf through the actual record books. While this collection has a lot a value to genealogists, it doesn't tell us much about Rosa herself. We know that she was extremely busy and that she must have been trusted since so many families called her in for the deliveries, but we know little else. Luckily we have an oral history in our collection, conducted almost thirty years ago in which Rosa's granddaughter, Pearl Bagan, recounts what she remembers of her grandmother's life and work. The combination of the oral history and the record book collection creates a much richer story than we could tell with just one or the other. The Rosa Fineberg Midwife Records were donated to the Jewish Museum of Maryland by Pearl Bagan as accession 1966.003 and Leonard Sollins as accession 1985.072. Jennifer Vess processed the collection in November 2009. Rosa Fineberg was born in Russia as Rosa Edelhurst, the only girl in a family of seven children. Her brothers became doctors and rabbis, and it is thought that she learned her midwifery from her brothers. Rosa married the chief rabbi of Katrinaslav, Russia, but later she immigrated to United States without him. She settled in Baltimore despite having all of her relations in New York, and, once established, Rosa brought over her three daughters – Sarah, aged sixteen, who married Max Siegal, Rebecca who married Harry Sohffer, and Pearl (the youngest). Rosa’s husband never came to the United States and the family lost touch with him after World War I. In Baltimore Rosa acted as a midwife, her records spanning the years 1895 through 1919. Rosa attended B’Nai Israel. The majority of the collection is made up of record books, containing the date of birth, gender, birth order, and place of birth of the child as well as the mother’s married and maiden names, mother’s place of birth, and the father’s name, occupation and birthplace. Not all of the records indicate the child’s name or gender. The record books are organized chronologically. 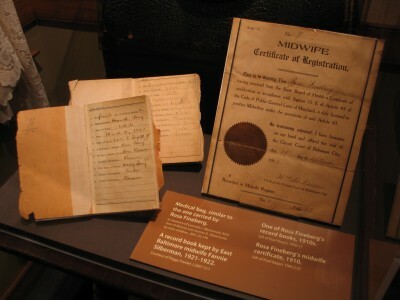 The collection also includes a computer printout of the information from the record books and Rosa Fineberg’s midwife certificate. The Baltimore Jewish Times publishes unidentified photographs from the collection of Jewish Museum of Maryland each week. Click here to see the most recent photo on their website. If you can identify anyone in these photos and more information about them, contact Jobi Zink, Senior Collections Manager and Registrar at 410.732.6400 x226 or jzink@jewishmuseummd.org. Status: Unidentified. Two doctors and three nurses standing on steps, n.d. Dr. Bernard Mark Berngartt is second from the right.